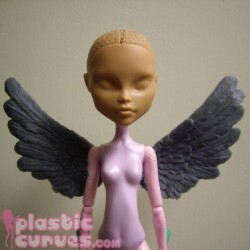 These resin cast wings are meant to be installed in your doll's wing ports. You may need to clean up the pegs so that it will fit into your doll's back. Wings There are 4 products. These are a pair of bird wings. They are ideal for an angel or avian girl. These are a pair of stylized bird wings. These are ideal for a pegasus girl (especially one from an equestrian world), angel or avian girl.